Christine Lagarde calls herself “an international animal”. After a year-long campaign all around the globe, she patiently convinced one country after the other until she finally succeded. The first woman named head of the International Monetary Fund in July 2011, she masters the art of public speaking. What strikes me most, watching her speak on videos, is her ability to adapt to any kind of context and audience. Maybe this has something to do with her past as a champion of synchronised swimming? She’s “like a fish in water” when she speaks in public and synchronizes with her interlocuteur. She can be commanding and direct, but she can also shift to a warm-hearted and engaging style of communication. Named the second top favorite personalities for the French people, she’s also plebiscited by the Americans. Here’s what Timothy Geithner, US Secretary of the Treasury, Time, April 2009, says about her: “Her lightning-quick wit, genuine warmth and ability to bridge divides while remaining fiercely loyal to French interests have been a source of admiration.” Her key assets? Perfect English, Precise, Allure and a Human Connector. What makes her really stand out as a speaker is her unique talent to adapt and engage with any culture and win people over. “Her personal style sends varied messages: To Britons, she is the rare continental European who has somehow mastered the art of small talk. To Germans, she is the rare economic leader who actually seems human. To North Americans, she is just like one of us,” says Doug Saunders of CTV News. Engaging introduction. From the start, she holds our attention speaking in French, very slowly and making pauses. She shares with simplicity and honesty how refreshing and intimidating it is to be there. She sets the tone with striking authenticity. “For more than thirty years, I have been operating in rooms crowded with men.” She knows what she’s talking about since she’s been both innovative and assertive in a man-dominated world. First woman head of Baker & McKenzie in Chicago, back in 1999. First woman French minister of economy and finance in 2007. And now, first woman head of the IMF. Walking her talk. Christine Lagarde's two major themes in this talk are trust and confidence. She inspires trust by reaching out to each one of us and she embodies confidence. She makes sure she includes men and women and all the actors of the economy, internationally. We need to embrace the change and rethink the model. It’s going to be for all of us. Flexibility and adaptation. She starts by making fun of herself and how the big screen reminds her of aging and then quickly moves us with stories of trust and confidence. Then her tone gets more serious, she speaks like a Finance minister, giving us precise data and striking figures about the gender element in Entrepreneurship. She tells us a joke (no, French people don’t strike all the time) then switches back to information about quotas and finishes with emotions. She plays with her voice and her body like an instrument, giving us a melody which is finely tuned with the audience and displaying a vast range of nuances. Powerful visual metaphors. Speaking about the controversial topic of quotas, she picks up on the pink fish infographics used in a previous presentation. We need to have more pink fish! She’s also using this excellent image of the first step women need to climb up the ladder and the necessity of temporary quotas. Legislation currently before the Senate in France would require that corporate boards be 40% female within six years. “The step is too high and we must have significant push and encouragement to make sure that it actually happens.” Striking and inspiring conclusion and a call to action. “I would encourage you every day of your life, as I try to do, to ask yourself one question. Did I, today, help another woman?” Simple. Direct. Warm. Authentic. Engaging. 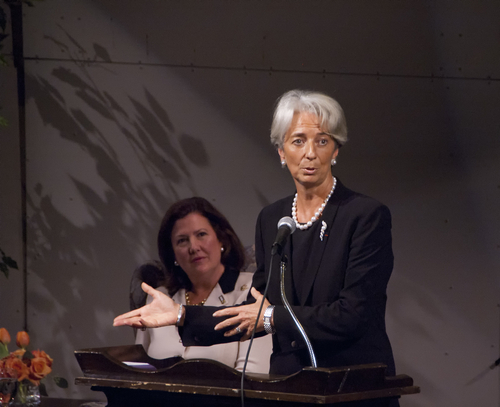 Christine Lagarde definitely takes the women’s side in the world’s economic jungle. She has five years to prove she can implement change. I believe her excellent communication skills, combined with her emotional intelligence and bravery will be major assets in this international jungle. Watch her famous opening speech at the Global Women’s Forum.